Sunday – the last day before you go back to the grind of work or school, and the day usually sat aside for lazing around in bed, enjoying brunch with the fam. One of my favorite things to eat used to be three egg omelettes, stuffed with Canadian bacon, cheese and whatever else I could find. Washed down with juice or champagne, that meal would easily hold me until late in the evening. In retrospect, the amount of saturated fat, cholesterol and general grossness I ate regularly makes me ill to think about now. So what do you do when eggs are out of your life, taking omelettes right along with them? 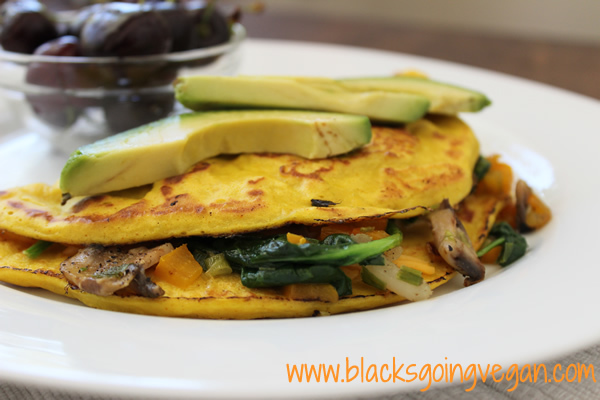 You get creative and you make a vegan omelette, that’s what! It’s totally possible with the help of three staple ingredients in vegan cooking: tofu, nutritional yeast, and chickpea flour. The recipe is below, but here are some pictures of the process. First, saute diced and sliced vegetables to stuff omelette with. Spoon batter into lightly oiled non-stick skillet that is nice and hot. Spread it around with spatula or back of your spoon. Cook for 3-5 minutes then flip. Look at that nice toasty brown coloring! After you flip it over, let cook a minute or so, then add your cheese. I used Go Veggie brand cheddar shreds. Then add your vegetables, just to one half of the omelette. Sorry, I had to take a big ole bite… I was starving! 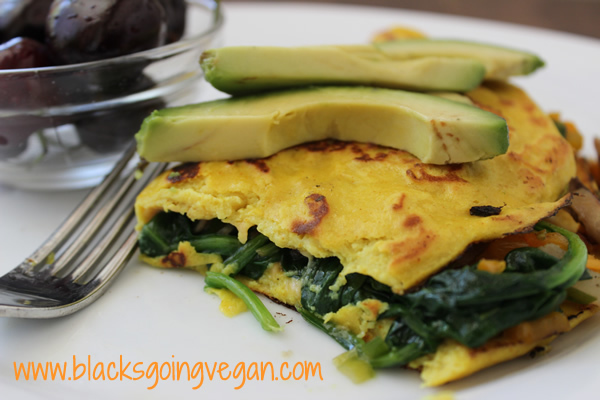 So there you have it – making a vegan omelette is fast and easy. All you need is a few ingredients, a blender or food processor, and memories of egg omelettes past to inspire your creativity. 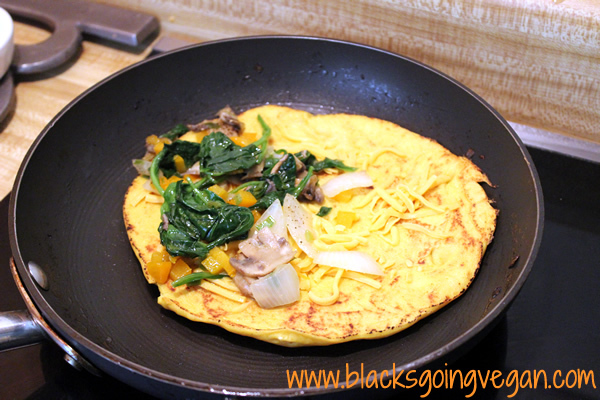 Vegans can still enjoy omelettes stuffed with veggies, cheese (vegan), and even vegan meats if you like. This quick to prepare recipe will serve a family of four. Add fruit or hash browns or grits, and you have a meal fit for a king! Place tofu in blender or food processor. 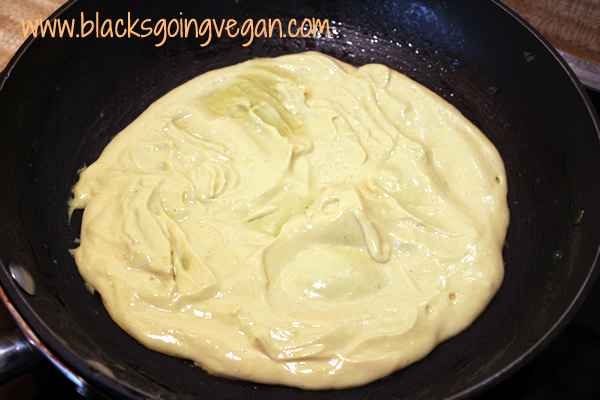 Add garlic, nutritional yeast, olive oil, turmeric, almond milk, and 1 teaspoon of Kala Namak. Puree until smooth. Add the garbanzo bean flour and arrowroot, and mix again for about 15 seconds, scraping sides as you go to make sure everything is well mixed. If mixture is too thick, thin it slightly with 1-2 tablespoons of water. It should be rather thick and pasty, but spreadable. This mixture does not pour. Set aside and prepare vegetables. 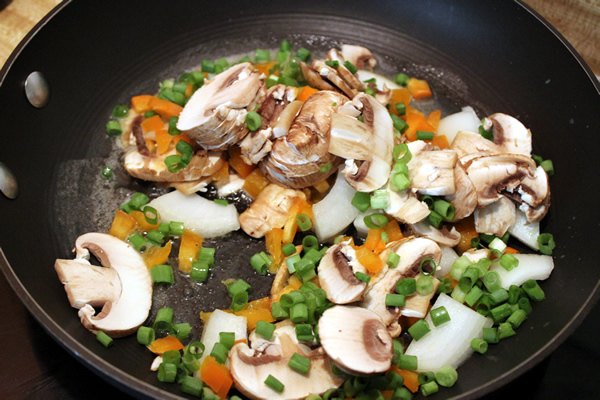 Make your stuffing by sauteeing onion, mushrooms and pepper in a 10" non-stick skillet in 1-2 tsps olive oil until soft. 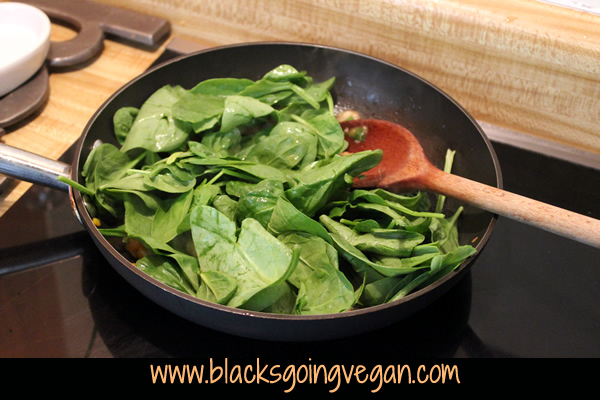 Add spinach and stir until wilted. Remove from pan and set aside. Return same pan to stove over medium heat. Spray with cooking spray if needed. When pan is hot, add one-quarter of mixture (between ½-3/4 cups) of batter to pan. Spread it quickly and evenly with spatula or back of spoon so that you end up with a 7-8" circle. Let cook over medium heat 4-5 minutes. 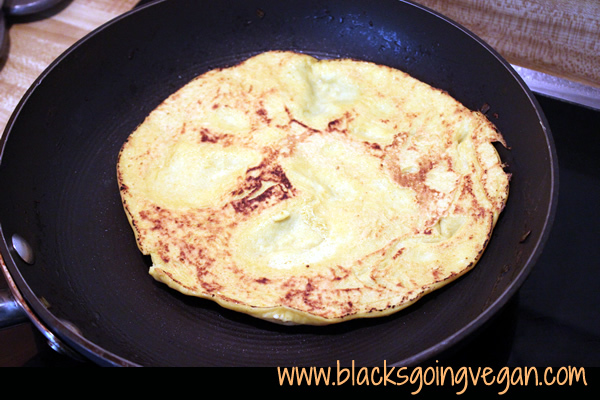 Shake pan to loosen omelette, then carefully turn it over to cook the other side. When second side has cooked about 30 seconds, add your vegan cheese of choice and stuffing to one half of the omelette. Sprinkle with ¼ tsp of remaining black salt. Flip other side of omelette over so that it tops the stuffing and cheese. 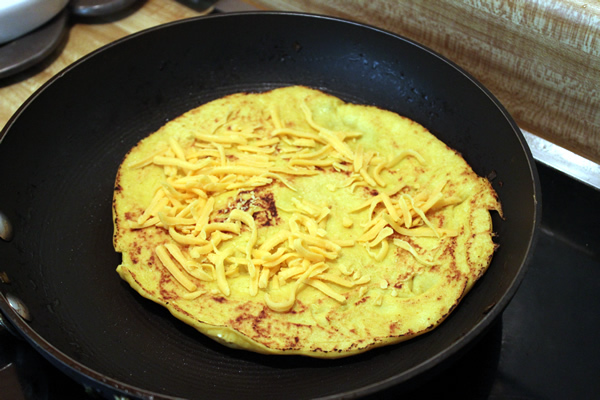 Gently shake pan to loosen omelette, then slide it out onto a plate to serve. Top with slices of avocado, salsa, or additional cheese. Greetings, I prefer scratch, homemade cheese also! Go veggie does have a vegan line of shredded cheese out. It is yummy! « What’s The Difference Between Vegan and Vegetarian?